There isn't a set date for the Snapchat IPO, but the company is working in overdrive to earn its $16 billion valuation ahead of its inevitable IPO. In a blog post on March 29, Snapchat announced the release of Chat 2.0. Similar to the features on Facebook Inc. (Nasdaq: FB) Messenger, Chat 2.0 allows users to send audio notes and stickers. Money Morning doesn't believe this is enough to win the social media war for younger users. In fact, there's a big reason why Snapchat stock could end up being a dud in the long term. Although Snapchat has never released its revenue totals, analysts project that the company earned roughly $50 million in 2015. But on March 8, inside sources told Re/code that Snapchat could earn as much as $350 million for 2016. That's a 600% increase in just a year. You see, Snapchat users received eight billion daily video views each day as of November 2015. Chat 2.0 now allows users to view "Stories" from their friends automatically when one "Story" finishes. That means Snapchat users can watch videos more quickly, which will keep them on the app longer. The more time users spend on a social media platform, the more likely they are to see advertising campaigns from companies. That means Snapchat earns even more from new advertisers. It could also encourage current businesses advertising on Snapchat to spend even more money. Many investors assume that Snapchat is a huge threat to Facebook. In a 2015 study by Piper Jaffray, it wasn't Snapchat that was considered the most important social network to teens. In fact, Snapchat finished in third with just 19% of the votes. You see, Instagram was voted the most popular social media site among teens with 33% of the vote. Facebook received 15% of teens' votes. Combined, 48% of teens felt a platform owned by Facebook was the most important social network to them. On March 8, Facebook announced it acquired the app Masquerade, simply known as MSQRD. This app allows users to create live filters that are used for selfies. These filters replicate a lot of the features currently available on Snapchat. In January alone, MSQRD had 1.92 million global downloads, according to Business Insider. In February, MSQRD was downloaded 7.6 million times and is currently on track for 13.2 million downloads in March. Masquerade downloads are skyrocketing, and Zuckerberg is known for massively increasing total users with his acquisitions. Instagram had 30 million users when Zucerkberg purchased it in 2012. Just four years later, Instagram now boasts over 400 million monthly active users (MAUs). He can do the exact same thing with Masquerade, cutting into Snapchat's user growth. You see, Facebook is already an established company with more revenue sources than Snapchat. Facebook is currently monetizing Facebook, Instagram, and its virtual reality headset Oculus Rift. Facebook is also slowly starting plans to monetize its communication services Messenger and WhatsApp. While sources told Re/code that Snapchat could earn $300 million to $350 million in 2016, that's nowhere close to Facebook's revenue. Analysts believe that Instagram brought in $650 million to $750 million in 2016, which is 114% more than Snapchat's projected earnings. For total revenue in 2015, Facebook brought in $17.93 billion. Adding more users through Masquerade makes Facebook and Instagram that much more attractive to advertise on. So clearly, the competition from Facebook will make Snapchat a risky investment when it comes to market. The hype around tech IPOs causes retail investors to develop FOMO (fear of missing out). If retail investors missed out on an early position in a past IPO, they will often vow to never miss out on the "next big thing" ever again. Unfortunately, IPOs aren't designed to reward our readers. Only large institutions and big investors who have an in with the banks underwriting the IPO make money. 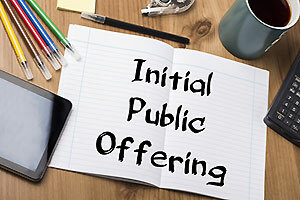 "IPOs are little more than a get-rich-quick scheme that's so heavily stacked against you that it makes the house odds in Vegas seem downright conservative," stated Money Morning Chief Investment Strategist Keith Fitz-Gerald. "I say that because you are literally the last in a long line of people who are going to profit from the IPO process." The most recent example of this get-rich-quick scheme was the Square Inc. (NYSE: SQ) IPO. After the Square IPO price was set at $9 per share, it was only the big investors and large institutions who were able to buy in at that price. SQ stock opened at $11.20 to the public on Nov. 19, and it closed at $13.07. Retail investors received a 16% gain, but that was a gain of 45.22% for those large investors who got in at $9. Like with most IPOs, the excitement surrounding Square stock quickly vanished. SQ opened at $8.27 per share on Feb. 9, which means retail investors would have lost 37% in just three months if they bought SQ at its first-day closing price of $13.07. The Snapchat IPO will see much of the same hype, since it could be the biggest IPO of 2016. 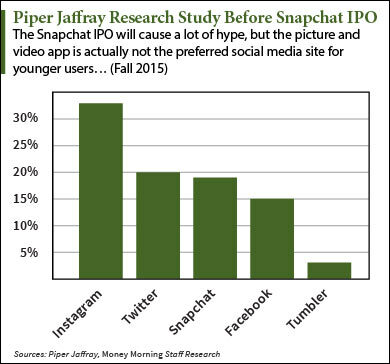 That's why we suggest avoiding the early volatility by not investing in new IPOs like Snapchat. The Bottom Line: The Snapchat IPO is going to be the most discussed story on Wall Street when it comes to market, and Chat 2.0 is making the social media market even more competitive. But long-term investors should not buy into the inflated Snapchat IPO price. When the hype dies down, it's the retail investors who get saddled with huge losses. Keep your money on the sidelines until Snapchat proves that it deserves your investment.